← What is Early Learning? Is it good to be smart? Obviously I think yes. That has been the premise of my work for decades as a teacher and non-profit executive, and is currently the premise of my children’s books, including the one I’m working on now with a multi-cultural focus. Is that what you think? “So,” the grandmother asked, “you disagree with her?” My quick answer was yes, but it’s not that simple. I think it’s a shame when children learn at home as well as at school that being smart is something to be ashamed of. Or, if it’s not shame, it’s taboo. We just don’t say we’re smart. The point of my book for small children is to do exactly what this grandmother’s daughter-in-law was doing, but with one significant difference. When I say “exactly the same,” I mean the book defines what some of the characteristics of being smart are – reading, using a good vocabulary, problem-solving, imagining, being good to the world around us, etc. By a significant difference, I don’t think the daughter-in-law should make the word ‘smart’ taboo. I used to do parent workshops on being gifted where at the beginning of a session, I would ask people to “stand up if you’re a good runner, a good pianist, a good cook,” etc. People would stand up with no hesitation to being good at different specific skills. Then I’d move on to “stand up if you’re creative, smart… gifted.” Usually people are comfortable with creative or smart, but rarely if ever are they comfortable with calling themselves gifted. This is the consequence not of anti-intellectualism but rather of a problem with comparing and labeling in our society. I choose to use the word smart in my books for young children because everyone should be proud to be smart. I’m troubled that this parent is not giving her child the freedom to understand that it is smart to be able to skillfully use all of his developing aptitudes in a positive way. So, the bottom line? 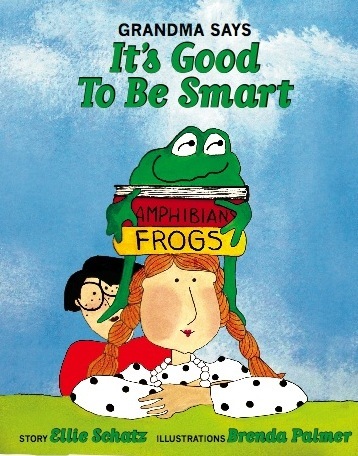 Grandma Ellie says it’s good to be smart. Grandma Ellie doesn’t limit her discussions of being smart to the skills in her book. Talking about using our cognitive as well as emotional and social abilities as we grow and learn and admitting there is a concept called “smart” can only help our children to understand themselves and others. This entry was posted in Children's Books, Core elements of learning and being smart, Early Learning, Grandma Says It's Good to Be Smart, Growing up smart, It's Good to Be Smart, Picture books, Showing versus hiding one's talents, Smart is cool, Uncategorized, Views of intelligence, Young Children and tagged academically minded, ages 0-7, be smart, grandparent alert, parent alert, raising smart children, understanding kinds of smart. Bookmark the permalink.